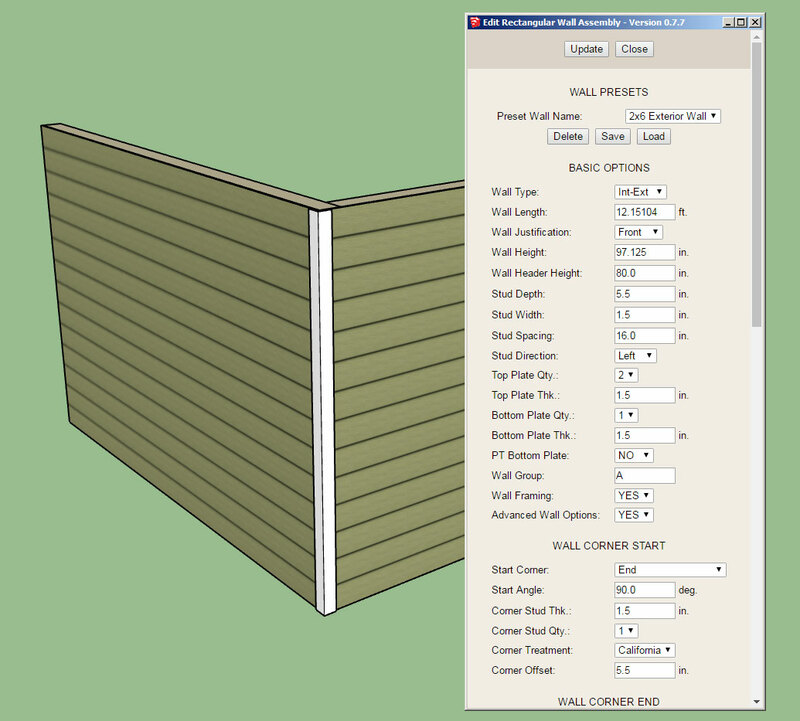 - Added 2D (construction or solid) line options for sheathing, cladding and gypsum within the global settings. - Fixed a bug within the corner trim module (trim width). Notice the wall presets section at the top of the UI, here you can delete, load or save a preset wall template. The actual templates will be stored in a simple text file within a sub-folder called "presets", that way the user can also manually edit the wall preset file and even cut and paste presets from other users into their preset file. This solution offers the most flexibility and user control in my opinion. Loading a preset will re-populate all of the parameters in the form below except for the excluded items. The save function will create a new preset (with user entered name/description) based on the currently listed parameters in the form. Does this make sense? and the better question, am I missing anything here? Hopefully this new addition of presets will speed up the wall creation process and spare the user from having to recreate a specific wall type from scratch each time they start a new model or session. I still have not fully arrived at what the excluded parameters should be in the wall preset functions so please provide any feedback in this regard. There are really three functions in one here: Loading, Saving and Deleting. Quite a bit of new code to implement the new presets system. I'm still testing it out to make sure it is solid, but so far it is looking pretty good. Note, that it is possible to give a preset the exact same name as another preset, this is by design and they will both appear in the drop down list. What you are not seeing in the drop down is the hidden number assigned to each preset which is stored in the presets file. This number is really the identifier of the preset and allows one to correctly specify which preset you are wanting to load or delete. Once this system is in place for the walls and fully tested and verified I will implement a similar system for windows and doors. I have a number of minor fixes and bugs that are quite hot items right now that have been delayed due to my attention to this latest upgrade, I apologize for the delay in getting the fixes out, but I really feel that this UI upgrade is top priority right now. I released the LT version of the plugin a couple days ago and I am surprised that no one has shown any interest in this lesser version of the plugin. Just to clarify, it is a full featured version of the plugin without the internal wall framing, estimating and engineering components. The ability to creating openings, windows, doors, exterior and interior cladding etc... is all there. The intended audience of the LT version is architects and designers who do not need all of the nut and bolts of the design (how it goes together) and are concentrating more on the big picture. Please let me know what would make the LT version more attractive to you the designer or architect. How would you use the plugin to create a building with a single slope? - Added the ability to create, load and delete wall presets within the Edit Wall (HTML) Menu. 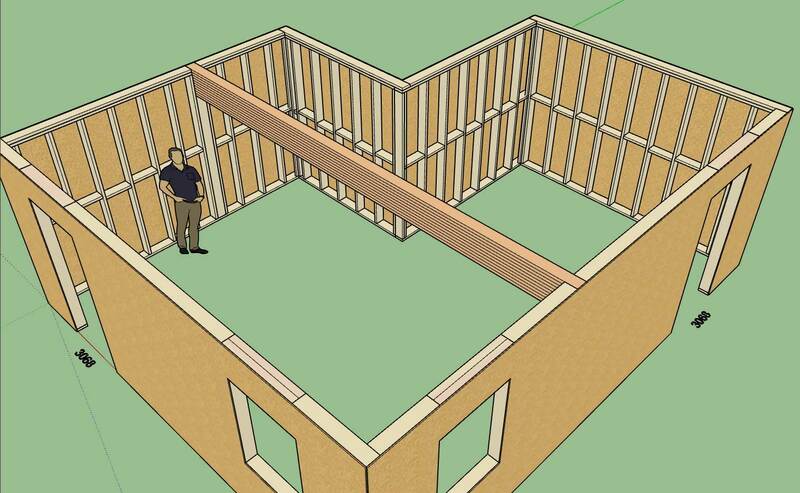 - Fixed a bug within the auto-corner configuration module which caused issues for walls less than 36" in height. Note that wall presets can only be currently loaded and applied after the fact (within the Wall Edit Menu). My intent is to also make this feature available within the reworked Draw Tool within the next few days but I first want to introduce this feature within the Edit Menu and work out any potential pitfalls before rolling it out further. 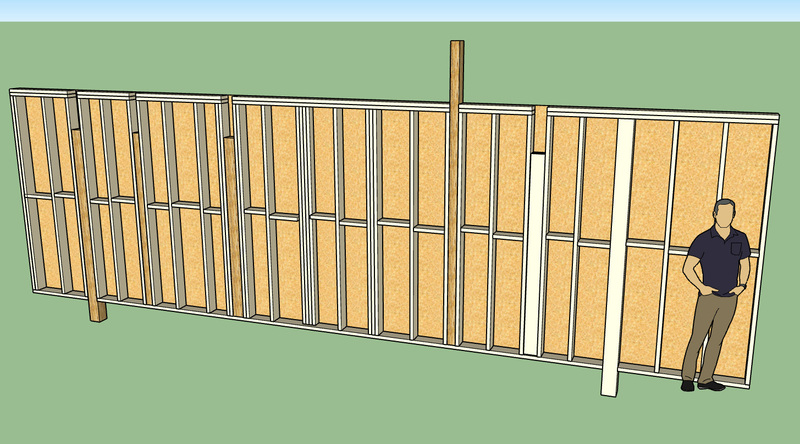 I still have not yet added the gable and shed wall tool, this will be added in the next few weeks but I am first ironing out as many bugs and issues with the standard rectangular walls. Just a reminder that tomorrow is the last day of the June promotion: Purchase the Wall Plugin and receive free licenses or license upgrades for both Truss and Foundation Plugin. I just need to add in the edit, move and delete tools to complete the Column Module, then I will release it. Even in fully conventionally framed houses this type of "in wall column" situation is not uncommon. 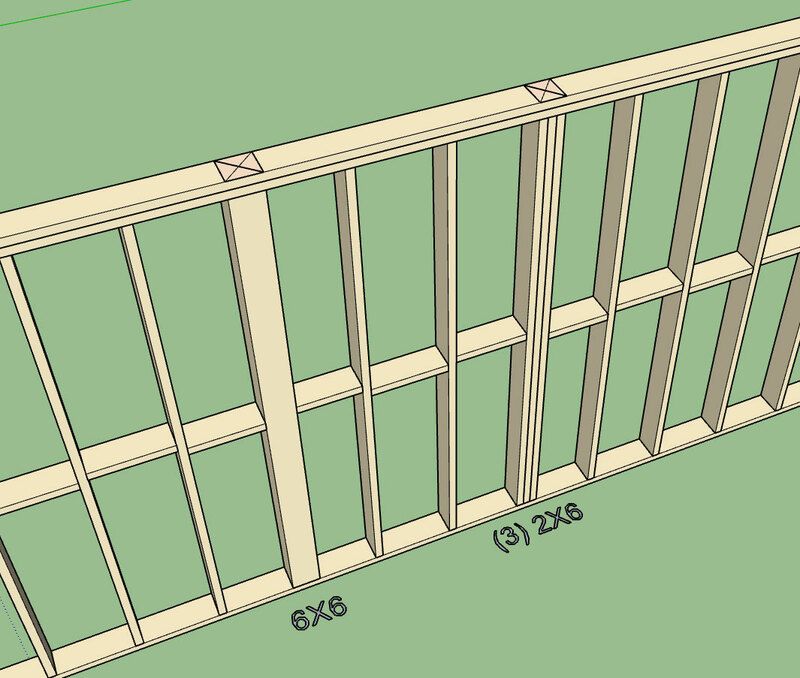 Sometimes the beam will run inside the floor and no beam pocket is required in the wall below, other times the beam will run below the floor or roof joists and in such cases a beam pocket is fairly standard practice. The column tool will allow for a number of configurations including PSL columns (standard sizes). The designer can also specify independently the number of king studs (0,1, or 2) next to a column and their thickness. The column can project above or below the wall, with the plates being cut out as needed. 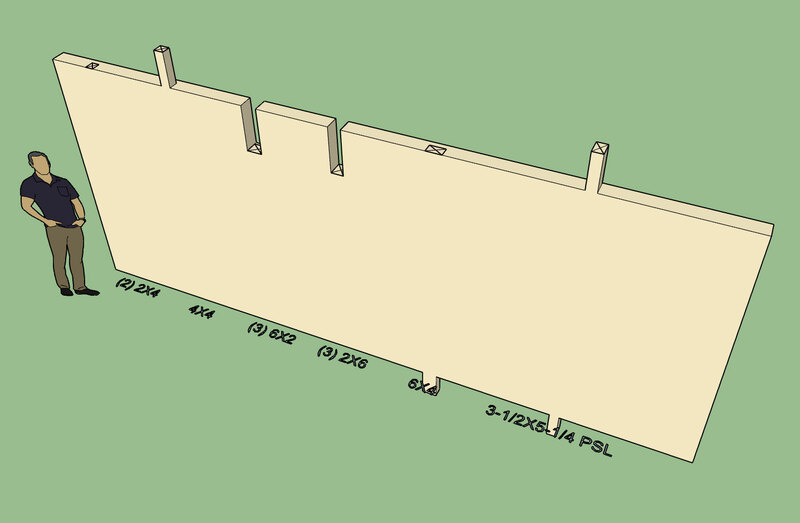 If the column height is specified as "FULL" then no cut out of the top plates is done and the column runs up to the bottom of the top plates just like the other studs. 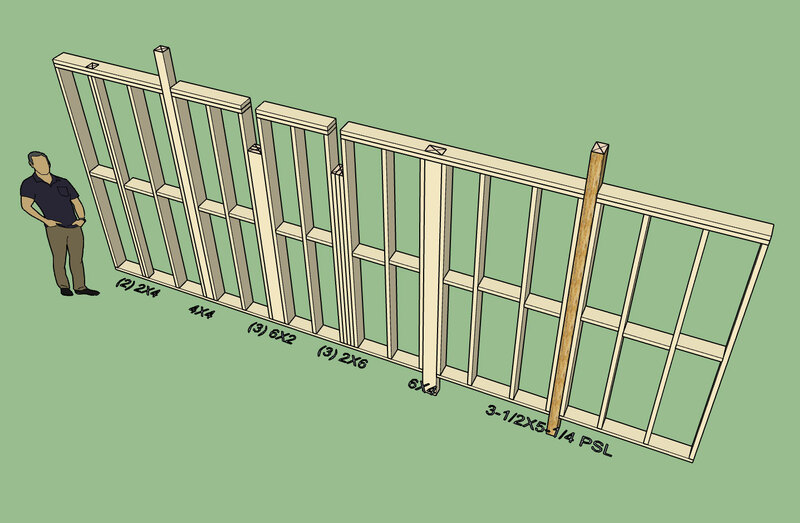 If certain sizes of lumber are specified (ie. 4x2, 6x2, 6x4) then the plugin recognizes that these are "on the flat" and will multi-lam them as so when more than one ply is specified. So one can create multi-lam columns (ie. (3) 2x6) oriented parallel or perpendicular to the wall. Similar to windows and doors the Column Edit Menu will allow you to edit any parameter of the column so that it is completely parametric. I've added another option into the global settings which will allow the user to toggle off the column annotations independently of the window and door annotations. All of the parameters in the Draw Column tool also have default values that are being pulled from the global configs, I will eventually add these into the global settings so they can be customized I just haven't figure out where I should put them. The global settings is starting to get rather populated with tabs and parameters, I actually need to create a second row of tabs along the top, I will give this some more thought. - Added the ability to draw, move and delete wall columns with the Beams/Column Toolset. - Added a parameter in the global settings (General tab) in order to toggle beam and column annotations independent of window/door annotations. 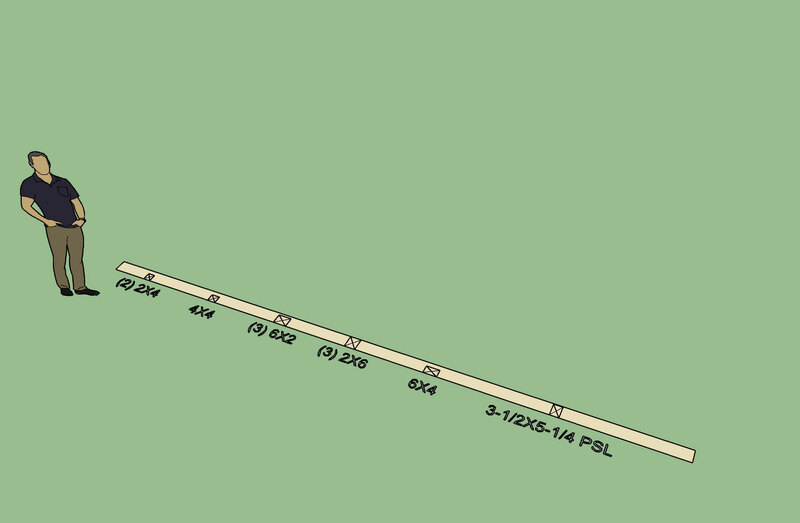 - Column annotations and representative geometry added to the 2D and 3D (no framing) modes. Now that I've got a couple larger items out the door, so to speak I'm able to clear my head and think about some other items that have been percolating for a few days. One of those items (technically it is not on my todo list) it how to preserve and maintain custom edits or geometry to a wall panel while still allowing for the full parametric ability of the plugin. In all honesty I probably have not given this enough thought but the subject has come up multiple times in the last few weeks with a number of designers so I think it is important enough to fully consider. As far as respecting manual edits to the geometry that the plugin creates I still do not see a rational way of doing this however if a user were to insert some additional geometry into the wall panel main group I think there may be an easy way to place this geometry into a sub-group(s) within the main group and then name that sub-group in such as fashion so that the plugin knows to maintain that sub-group and hence it will persist even with multiple edits or other operations to a wall panel group. Would such a feature be useful to you the designer? - Sub-groups within wall panels can be made persistent by naming these groups or component instances to (custom1, custom2, custom3, etc...), also all other user defined geometry (ie. faces, text, lines and dimensions) are also retained when the wall panel is regenerated by the plugin. The naming of these persistent groups does not need to be in any order or even follow any particular naming convention, the key thing is that the instance name contains the word "custom" in it. The name is also not case sensitive. I've tested this out a bit this afternoon but it is quite new so I'm hoping everyone can work it over and see if they can break it or at least find any flaws in it.